5793 labyrinths found. Showing 4761-4780. Sorted by country, state, city, then zip/postal code. Located in York County, southcentral Pennsylvania at Highland Farm, an organic Community Supported Agriculture Farm that nutures the sustainability of the land and the Mind, Body and Spirit of All that share it. CATRA offers an equine facilitated experience to people with disabilities. Located 8 miles north of Hershey and 15 miles east of Harrisburg, PA.
We are on Rte. 819 North, just 1/2 mile past St. Emma's Retreat Center. Two Canvas Portable Chartres style labyrinths: 24 & 12 feet. Painted 'brick pathway' labyrinth. I also draw 28 foot labyrinths with chalk in parking lots, etc around here, so far mostly at Drake's Well Park. 41.627 N° Lat. ; 79.674 W° Long. Jacob Pilch, Eagle Scout Project. Assisted by members of Boy Scout Troop 3 Hatboro, and members of Gwynedd Friends Meeting. From PA Route 63 (Sumneytown Pike) go north on PA Route 113 (Harleysville Pike). Turn right on Yoder Road. At the first stop sign, turn left. Nearly immediately, turn right into the parking lot for Peter Becker Community. Park, then proceed into the main entrance (left of the chapel). Once inside, ask the receptionist to direct you to the Orchid Terrace. Generally the labyrinth will be available between the hours of 8:00 AM and 8:PM. It will not be available when activities are scheduled in the Orchid Terrace. 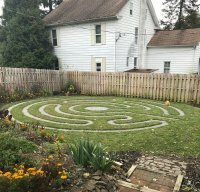 The labyrinth will definately not be available 5 weeks prior to and 2 weeks following the Philadelphia Flower Show, for our community's flower show. None, unless used for an event requiring a fee. To fit the odd shape of the Orchid Terrace and to make the labyrinth wheel chair accessible, although a Roman-type design was used as the basis, it was modified to fit the room. perhaps it could be called Comtemporary Roman? Our outdooor labyrinth is situated at 815 Maplewood Drive -take SR 133 north from Harleysville, turn right on Schoolhouse Rd and proceed to the 2nd entrance of Peter Becker Community on the right. Drive a short distance on Maplewood Dr and turn left into the public parking lot. 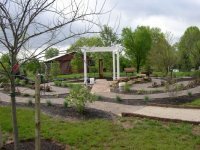 Walk down Maplewood Drive towards the Gazebo, turn left on to the path after passing the retention pond on the left and proceed on the crushed limestone/brick path to the labyrinth. Occasionally there may be schelduled activities at the labyrinth site. 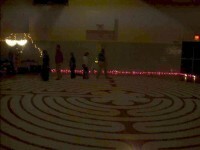 Besides those events, the labyrinth may be used between dawn and sunset. If you wish to use the labyrinth after 8:00 PM please notify the chaplain before 4:30 PM that day to get permission. 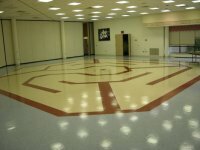 The labyrinth is on the property of a Non-Profit Continuing Care Retirement Community that is affiliated with the Church of the Brethren: Peter Becker Community. The community is home to 500 residents. 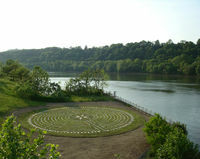 The labyrinth is open to the public as well as to the community's residents. Please respect the property as you would someone's home property. Elements of both the classic and medieval types were used to design this labyrinth. 40.2882 N° Lat. ; 75.3690 W° Long. Labyrinth is open during daylight hours for groups or individuals, except on Sundays during worship services, when it is open only to individuals. Please sign the log book. The labyrinth may get over-grown during the summer, because weed-whacking the rocks is a no small task. 40 19' N° Lat. ; 76 49' W° Long. Labyrinth is in field just above top parking lot. Labyrinth is maintained by volunteers: how "kempt" it is will vary by when you visit. This is the shape of our Garden Labyrinth! Church of the Redeemer United Church of Christ's Garden Labyrinth is located at the southwest corner of the church property off of Orchard Road. The entrance walkway is accessed from the alley between the church parking lots. Written guides are available at the entrance. There is also an opportunity to create and hang a Tibetan prayer flag at the top of the labyrinth. Our labyrinth design is a caerdroia (Welsh for "fortress of turns") and is very similar to a classic sevenfold labyrinth. The design was chosen because it mirrors the design of our sanctuary windows, drawing worshipers in and out to pray and serve. Located near Historic Pump House below train overpass on 880 Waterfront Drive, near condos. Chartres 11 circuit, grass path lined with special cobblestones. Inscribed scripted stone points outline the entire circumference. Grass, cobblestone and cut stone.